Over the weekend, it was reported that Ghana’s fastest growing media brand, Zylofon Media, signed dancehall artiste, Shatta Wale, to a juicy deal. 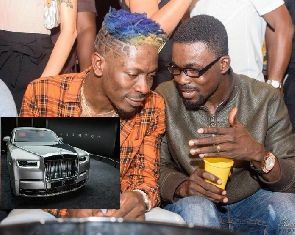 The reports claimed that Zylofon media promised the Champion a very enticing sign-on fee which is $1.5million dollars including a house and a car. The location of the house is unknown but the CEO, through an Instagram post, gave a hint of the car. He likened the lights of the car he is about to present to the dancehall artiste to that of his eyes.